You didn't think I could post polka dot kitties without posting something for you dog lovers, did you? To be absolutely honest, I'm a cat person through and through, BUT there are *certain* dogs I love. Like this one. Have you met Doogan? This dog really needs to be in commercials, movies, something! He's even cuter in person...I love him. Maybe it's the curls? We curly-tops have to stick together, you know. I realize Doogan is not a Scottie, but it's the only dog cutter I own. 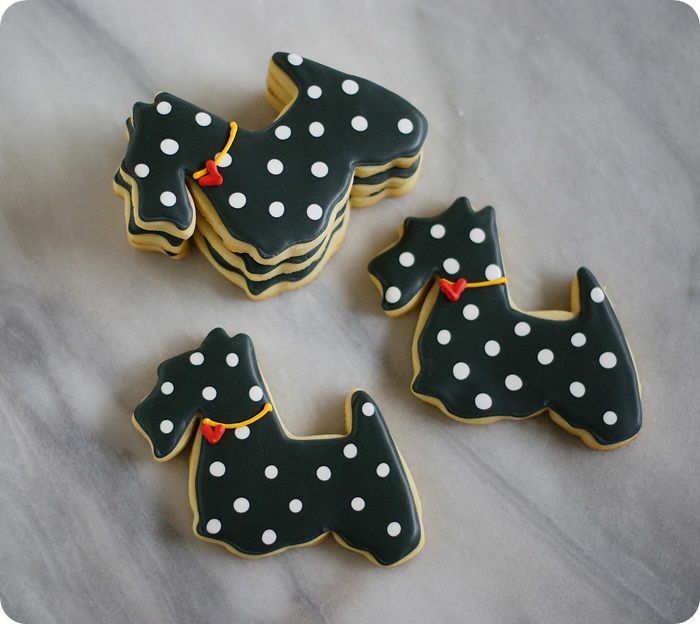 These cookies are SO easy...the perfect treat for any dog lover in your life. I started with all black with white dots, but I felt the need for some pink as well. Valentine's Day IS around the corner, after all. 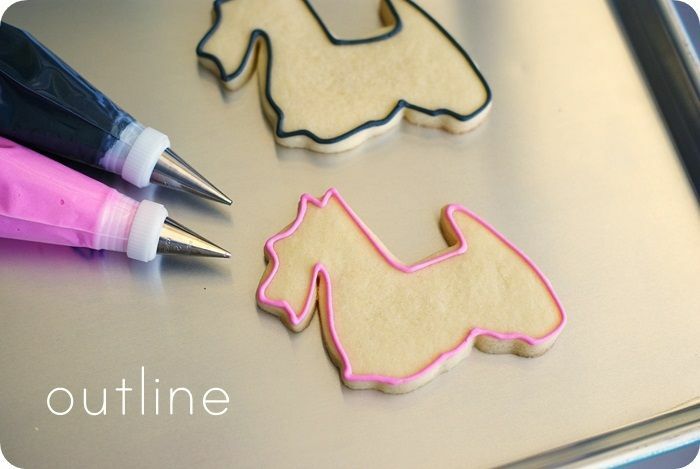 Use a #2 tip to outline the cookies in pink or black, or whatever your base icing color may be. Thin the pink, black, and white icings with water, a bit at a time, stirring with a silicone spatula, until it is the consistency of a thick syrup. You'll want to drop a "ribbon" of icing back into the bowl and have it disappear in a count of "one thousand one, one thousand two." Four is too thick, one is too thin. Count of 2-3 is good. Cover with a damp dishcloth and let sit for several minutes. Working 6-8 cookies at a time, fill in the outlines with the thinned base icing color, using a toothpick to guide to the edges and to pop large air bubbles. Let the cookies dry 1 hour. Use #1 tips to add the collar and heart tag detail in yellow, red, and black. Cat cookies? Check. 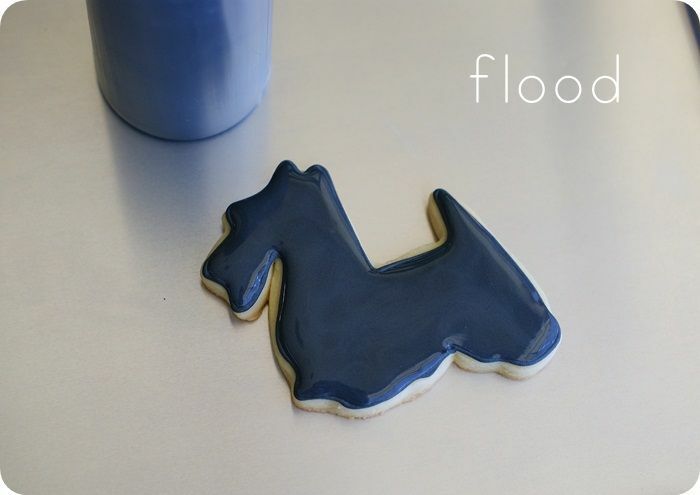 Dog cookies? Check. I'm in the cat lovers camp but these cookies could swing me the other way, they are adorable!! These are some classy cookies. Wow amazing among I love love dogs!! I'm a dog lover and I love the cookies too. You make the cutest cookies. Thank you for featuring us on your cookie blog. 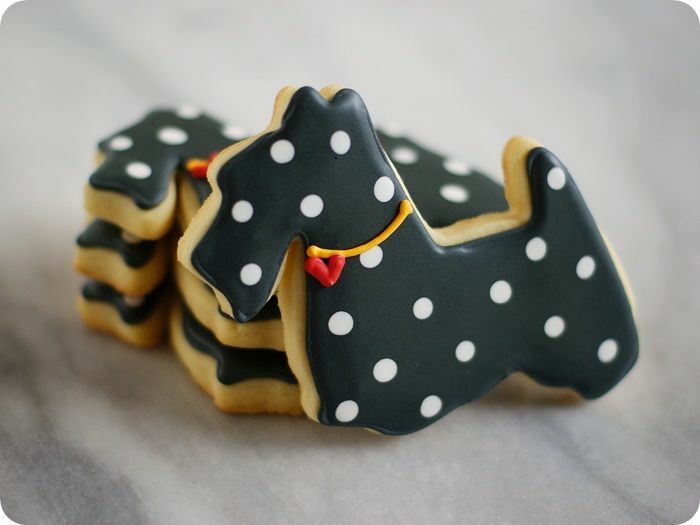 We love the Scottie Cookies with POLKA-DOTS! And of course we adore the DOOGAN cookies you surprised our mommy with when you came to Seattle! We feel honored that you chose us to feature as the "sweet doggies in your life." Thanks for loving us and commenting so sweet on all of our Instagram pictures. You always make our mommy SMILE! We really wish you and Kiddo and Mr. E lived next door so we could play with the Bluebell and Spike! Give them a snuggle from us and tell Kiddo Isabelle wants to meet him! Sending you hugs and LOVE and snuggles and kisses and everything SWEET! These are the cutest cookies I have ever seen! LOVE THEM. These are gorgeous! Really! I love them! I have a little yorkie and I am sure that cutter can pass as a yorkie too! These are too cute!!!!! CUTE! love their heat collars! Two of my favorite things, dogs and polka dots. Adorable! 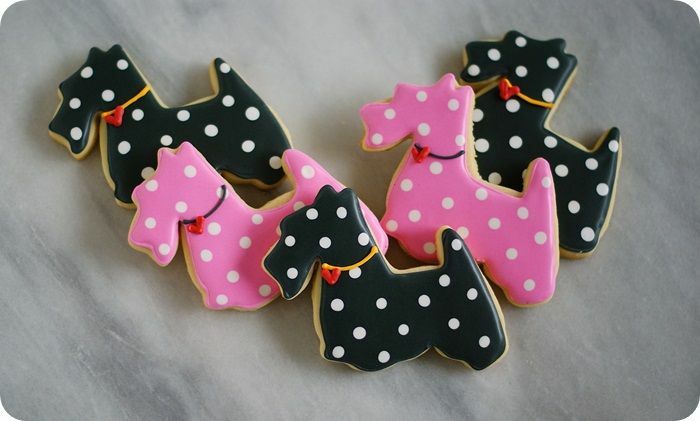 Scotties have ALWAYS been my favorite...Lucy even has a pink polka dotted onesie with a little gray Scottie on it!!! These are so stinkin' cute!! AAAh! These are super adorable. I love them. 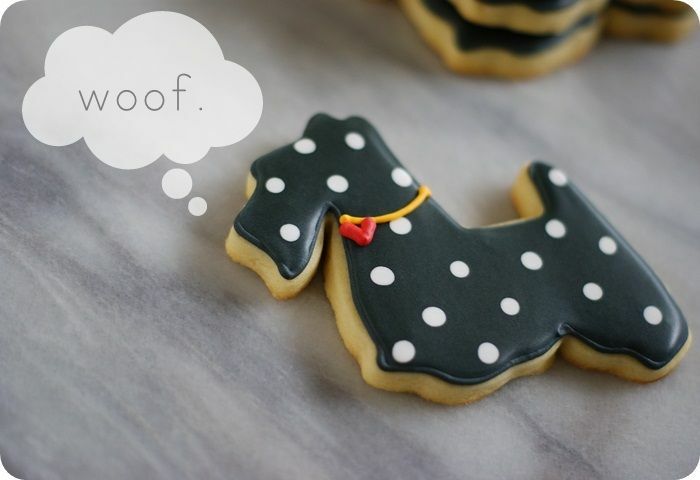 Now I know how to cute-ify my black lab cookies for my husband for Valentine's Day~I think she(our lab, Riley) is his true love~haha! What cute cookies you make! I have tried making them (the cookies themselves are great..no issues there), but I really struggle with the frosting. Seems I can't get the right consistency to do the flooding. I have some adorable grandkids and friends I would love to make cookies for special occasions but I steer away from it because of the frosting. Wished you would host webinars or youtube or come to Mpls to do demos...I'd be the first in line. What is your secret? Am I giving up too easily? You are so talented Bridget and each of your cookie is like an artwork. Continue like this, i love your blog. So im having my tea this morning and thinking about you and thought I needed to stop by & see what your latest cookie creation was. And these are just simply ADORABLE!!!! My mom has a black scottie dog & we are Scottie lovers over here. LOVE the pink one too!! These are stunning. Love polka dots. These are the most adorable cookies! You are so talented and creative! Your polka dots are so perfect! Mine never look like that! LOL Love them! These are so adorable. 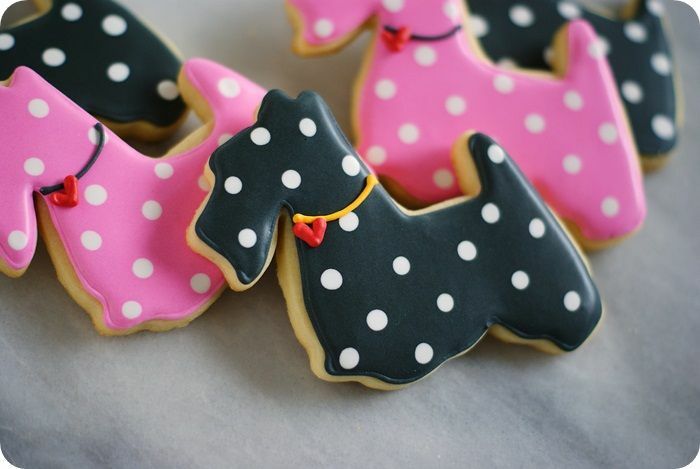 My best friend would love these since she has a scottish terrier. Ugh! This are soooooo cute! !Can't wait to give them a try! Oh my god, I'm going to HAVE to make these into sausage dog cookies. What's better than combining my love of them and sugary food! Amazing! These are so incredible darling - love the colors too!!!! Scotties are our school mascot! 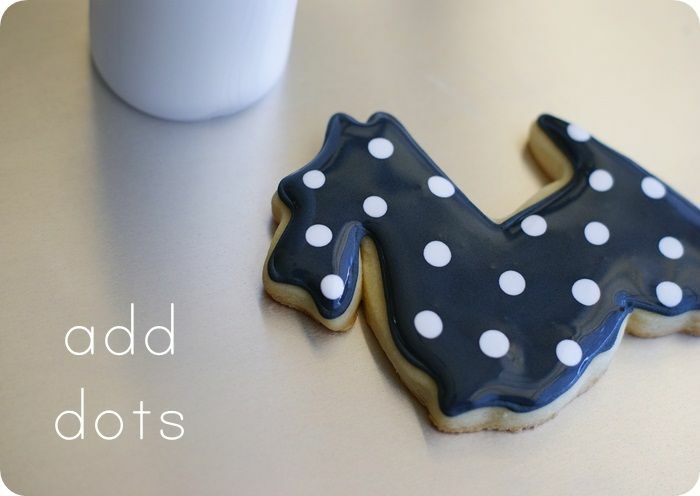 These would be a cute surprise for the first day of school or at a graduation party.